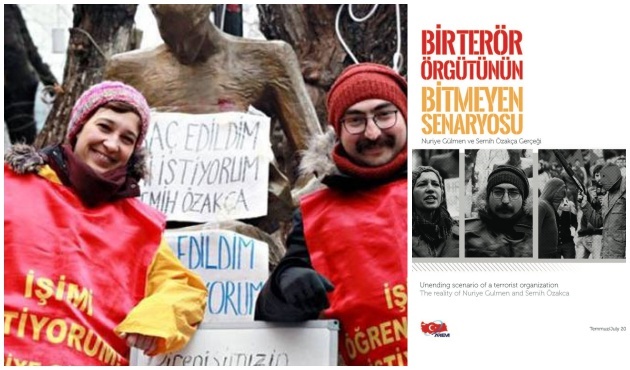 Turkey’s Interior Ministry has published a 54-page-long booklet on the outlawed Revolutionary People’s Liberation Party/Front (DHKP/C), in which it described the jailed educators who have been on hunger strike in protest of the government’s post-coup dismissals. “The endless plot by the terrorist organization: The Truth about Nuriye Gulmen and Semih Ozakca,” the book’s title read. Gülmen and Özakça, who were arrested on the 75th day of a hunger strike which they started to protest their dismissal by a post-coup government decree, have been on a hunger strike for over 130 days. Despite the government propaganda, there is no court ruling to prove the terrorist activities involving the two. The ministry said in the book that the the colors that the educators used in their protest materials and their participation in demonstrations organized by legally functioning organizations – such as labor unions and human rights institutions – were terror evidence. The book was published both in Turkish and English language. Gülmen was fired from Konya Selçuk University for her alleged ties to the faith-based Gülen movement. Özakça was a teacher at a primary school in Turkey’s eastern province of Mardin before he was purged over ties to a “terrorist” organization.